“When Mom Was My Age” is an interview series between daughters and mothers. New interviews appear every Monday. If you would like to participate, contact Jane. The following interview is with Carla Ligon (age 56), reflecting on her life at age 32, interviewed by daughter Michaella Hammond. When you were 32, the year was 1987. Where did you live? At 32, I was a single mother of two beautiful daughters, the lights of my life. My divorce was two years prior and I had purchased my first home all by myself for my girls and me—complete with a swimming pool! We lived in Blue Springs, Missouri, where you attended school. Our home had 3 bedrooms and was the largest home I had lived in since graduating high school! What did you do for work, and what was your typical day like? I worked for my mother at our chain of small community newspapers as the Vice-President. This entailed typesetting, writing, laying out the blue-line boards (this was pre-Mac, pre-digital layout), and delivering the boards for all papers to our printer in Liberty. Our workday usually began at 9 a.m. with Friday nights usually lasting until midnight. Once we purchased our own presses, it was not uncommon for me to work Saturday and Sunday, depending on equipment difficulties. A typical day would entail getting you and Jenna ready for the school day as well dressing for my workday. On the days I kept regular hours, I would arrive home by 6 p.m., pick you up from the sitter and go home to make dinner. Weekends that entailed work, I would take you and Jenna with me, bring your sleeping bags, a small TV and any snacks on hand so you could bed down in my office while I worked. I was happier having you girls with me than with a sitter on those nights! Being able to support and take care of my daughters alone. It was important to me to give my girls a good life even though I was a single parent. After you faced that fear and were able to support us, how did you feel? I was really proud. It was something I had never thought about doing all by myself. I was very proud that I was able to do that. I had more hope for my daughters—if I could do it at my age, then the future looked very good for you guys because things were changing. What do you mean by “things”? The current economic and political climate as far as women in the workplace. It started changing—the stigma against working mothers—when I was in college and when I was a young mother. For me to be able to get a good paying job to take care of my two daughters and buy a house, then I knew the future looked bright for my girls, too. I hoped the future would hold promise for my girls, a measure of peace to my personal life—freedom from strife. I hoped to use my education to secure a position in art, somehow. How do you look back at age 32 now? I was very naive at 32, but learned a great deal. I was starting life over, rebuilding after a failed relationship and I was full of hope for the future. One of the things that really moved me about my mother’s interview was that I hadn’t considered how scary and exhilarating starting over must have been when my mom and dad divorced. When I was done interviewing my mom, I felt inspired and humbled by her choices—I am incredibly happy and grateful to have a mom who saw opportunity in her life even when the future was uncertain and sometimes painful. I also had no clue my mom was vice president of my grandmother’s chain of community newspapers in suburban Kansas City, Missouri. I just thought she was a graphic designer at the Pony Express. I vividly remember playing in an old darkroom in the newsroom with my younger sister Jenna. In 1987 I was 9 and my sister was 6. We routinely asked the layout people for rubber cement and X-Acto knives to make our own newspapers; I also remember getting cellophane-wrapped hard candies from the pressmen. The smell of newsprint still permeates memories of my childhood. I have always loved my mother, but I never realized how her quiet, gentle strength has shaped who I am as a professional. I majored in journalism at the University of Missouri even though I swore as a child I would not have the crazy hours my mom and grandma did. My mother showed me that hard-working, smart, and capable women are all around us, and they are tremendously influential. Long before I read Virginia Woolf’s A Room of One’s Own or heard Dan Quayle’s infamous “Murphy Brown speech” in 1992, I had my mother’s pioneering example. I am so glad she took me to work with her when I was younger. 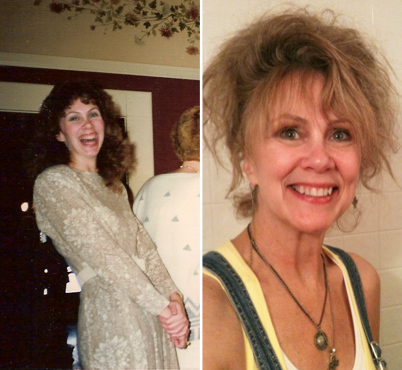 I grew up knowing—never doubting—that women could be whatever they wanted thanks to my mother.